MHG ProCon gas condensing wall mounted commercial boilers deliver exceptional energy efficiency to help building owners reduce their energy costs and carbon emissions. This addition to the range ensures there is a ProCon wall mounted commercial boiler for nearly all commercial and residential applications. Output ranges from 3.3 to 26.0kW. Extremely high energy efficiency with fuel engineering related efficiency of up to 108.2%. From flats through detached houses and apartment blocks to commercial properties – the wide range of wall-mounted ProCon gas condensing boilers with their various equipment packages are ideal for a wide range of applications. 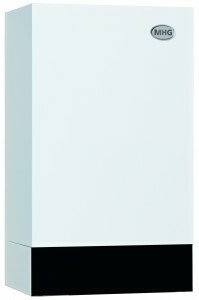 Thanks to their compact design, contemporary styling and low-noise operation, ProCon condensing boilers can be installed practically anywhere in the building. Highly efficient performance results in lower fuel consumption, lower heating costs and lower carbon emissions. High-performance, stainless steel heat exchangers guarantee high reliability and long service life. Particularly cost-effective maintenance as a result of easily accessible construction. The option of using inexpensive and at the same time high-quality plastic exhaust systems, cost-effective flue renovation, including flexible flue systems. Integral cascade controls available for up to 16 ProCons and limitless heating zones. The ProCon E 26 S offer the ultimate in hot water luxury, with an integrated plate heat exchanger and a three-way changeover valve for heating water by the continuous flow principle. The ProCon E 26 S combination boiler modulates between 3.3 and 26.0 kW, with a delivery rate of 11.5 l/ min..
Twin Coil solar units are also available.